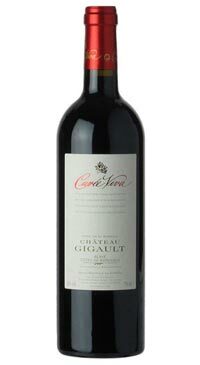 Chateau Gigault was created in 1998 by Christophe Reboul Salze and is located in the Premieres Cote de Blaye appellation. Christophe Reboul is a winemaker and has his own negociant business, The Wine Merchant. The Chateau Gigault vineyard is planted to 90% Merlot and 10% Cabernet Franc. In total, the vineyard is 17.7 hectares in the Coates de Bordeaux appellation. The terroir is clay and limestone with silica deposits in the soil. This cuvee, which is generally 100% Merlot, is whole berry fermented in a combination of small cement vats and stainless steel tanks of various sizes with malolactic fermentation happening in French oak and tanks. Malolactic fermentation takes place in a combination of French oak barrels and tanks. The wine is then aged in 40% new French oak barrels for about 14 months.